Blending the best of natural ingredients AromaMusk brings to you a combo of essential oils for the physical and mental well being. AromaMusk's Rosemary Oil has a fresh, sweet herbaceous (medicinal like) aroma. Rosemary is often used in aromatherapy to provide both an energizing as well as calming mood lifting experience. This ancient essential oil is extracted from steam distillation process of fresh and natural rosemary leaves contains antifungal and antimicrobial properties. This essential oil can also act as an all-natural all-purpose cleaner to keep your home fresh and clean. 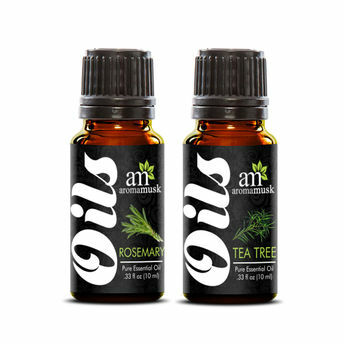 AromaMusk's Tea Tree Oil has a fresh, herbaceous and medicinal aroma which is relaxing & refreshing. AromaMusk's Tea Tree Oil is Steam Distilled Highest Quality Oil Extracted from the leaves of the Melaleuca Alternifolia. Tea Tree is often used in aromatherapy to provide both an energizing as well as calming mood lifting experience. This essential oil is well-known for its purifying and cleansing properties. Tea Tree essential oil is often being used to clear breathing, purify the air in our homes. Additional Information: Detoxify your life using AromaMusk Essential oils. These 100% authentic therapeutic-grade oils have great antioxidant, antimicrobial and anti-inflammatory properties along with many health benefits, especially when used for aromatic and topical use. Essential oils offer great health benefits for your skin and hair and they can soothe and rejuvenate your body, mind, and soul.